Abandonment is just plain criminal! 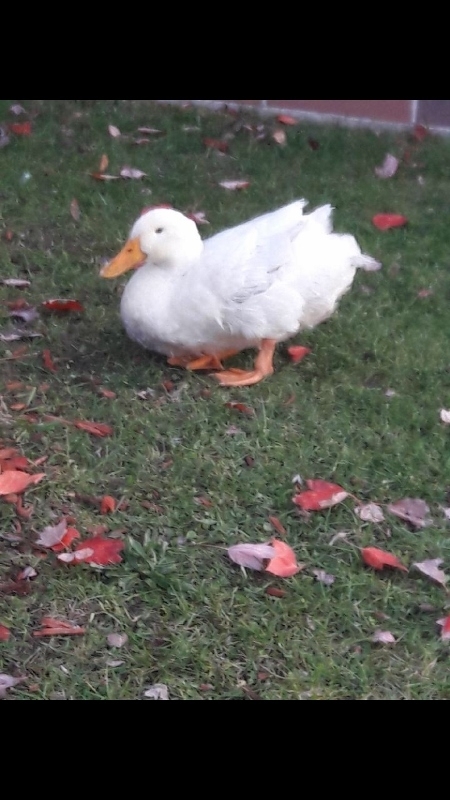 Yesterday, 11/7/17, late afternoon, dinner time for most normal people, I received a call from Wendy from Walmart, in Canton, telling me that she had noticed a large white duck in the back of their building on Ford Rd., just sitting near the rear door of the store, where a sufficient amount of traffic literally rushes out the back exit of the parking lot. The very dangerous street separates the store from a retention pond where these ‘four’ angels were DUMPED by some absolute idiot. 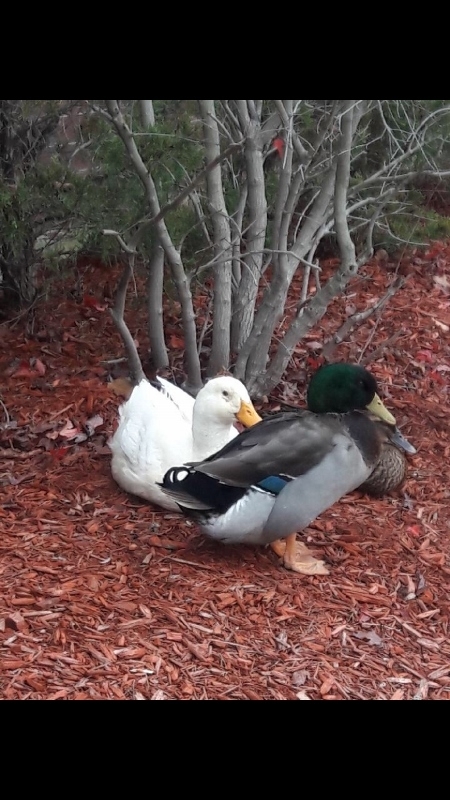 She mentioned that the white duck (a Pekin), was in the company of two other ducks, which she thought were perhaps mallards. After she sent me a picture, my hunch was confirmed. 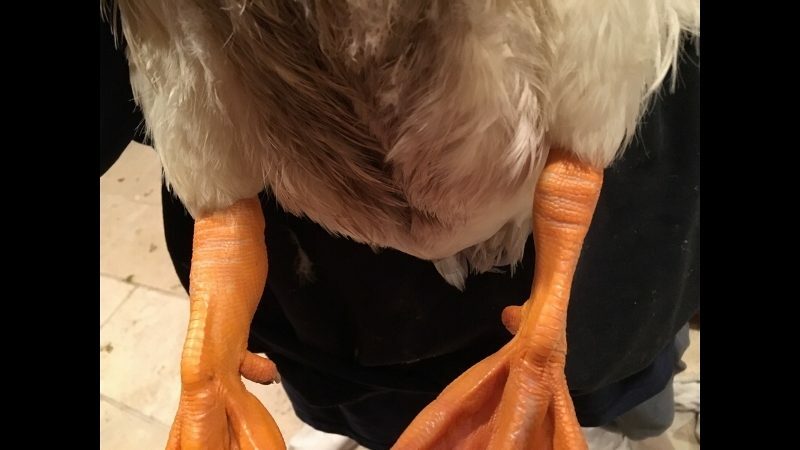 He was abandoned along with a male and female Rouen, which resemble a much larger version of a mallard, but are nonetheless domestic. My first thought was to call ‘Angie to the rescue’, one of our extremely helpful volunteers, along with her very skilled, and fearless daughter, Kaitlyn. She said that she was able to leave in about 20 minutes, at which point, Theresa and I thought we should scrap our plans, the nightly roundup just around dusk, and make sure the manpower was sufficient, as nighttime crept up. By the time we had arrived, only about 40 minutes, Angie and Kaitlyn had already been easily able to scoop up the frightened and huddled mass of terrified babies, which had been there alone for at least three days that we know of. Many Canada geese hang out on that back road because of the pond. One goose had already been left dead by a careless driver. 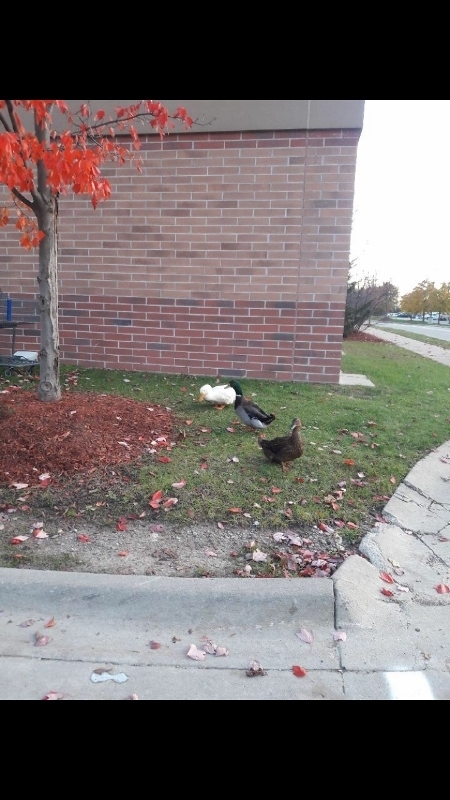 Angie had told us that as soon as they picked up the ducks and secured them in the car, a car with a bunch of ‘expletives’ in it, blew through the stop sign and headed for the geese in the street. 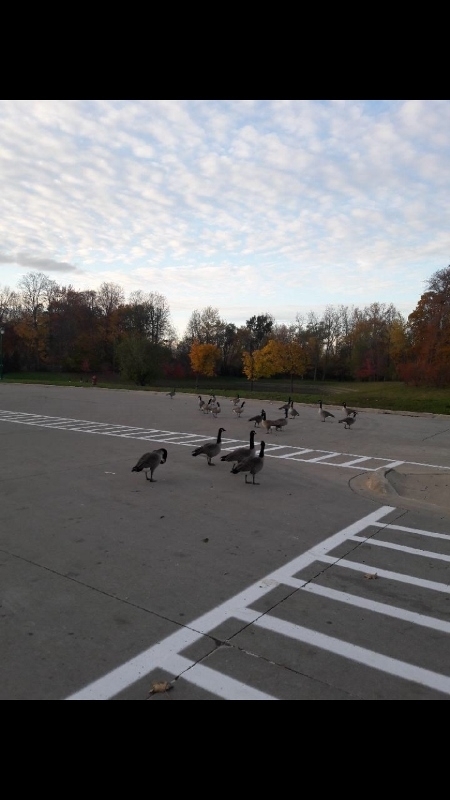 Angie then swung her car out in front of the geese as to block the car from a certain goose slaughter. She then yelled at the driver and said watch out for the geese, to which the driver yelled back, “I don’t give a **** (coincidentally rhymes with duck) about them!” Just some of the things we often deal with on a regular basis. As we were ready to put the ducks in our car, Kaitlyn heard, and briefly saw, another Rouen girl alone in the pond, well away from where the others were found. It was dark by then and I had forgotten to bring a spotlight, just in case. So I went around front into the store, and needlessly shelled out a ‘half a yard’ of green ($50) for a flashlight with some juice still in it, to try to help find the MIA (Missing in Action) girl, especially since we have many such lights at home. 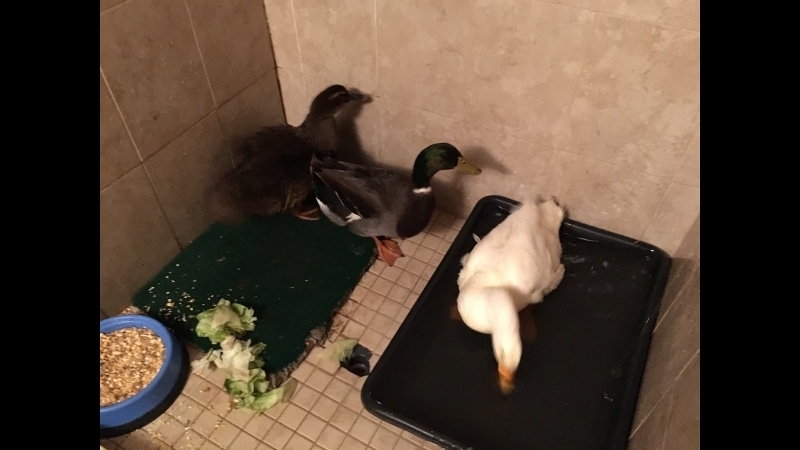 A vigilant search lead us to a large storm overflow drain, which was protecting human entrance with a welded screen over the opening, but not so small that a duck looking for protection, might find shelter. We heard a splash, and when I looked into the drain, the last girl was 50+ feet in, and disappeared from sight when she literally took a left turn under the parking lot drain system. Today, Angie and Kaitlyn took to trips back, but to no avail. However, I do assure you, if she is there, they will bring her home! 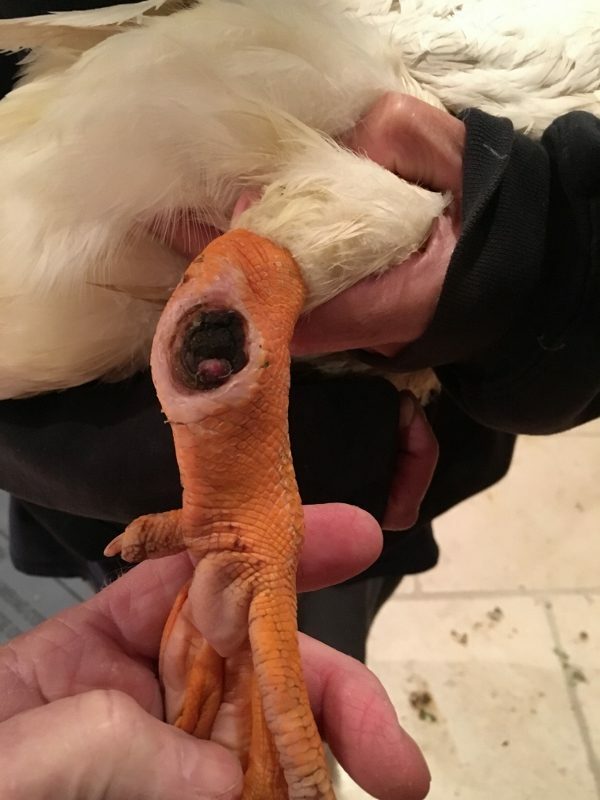 Sadly, the boy Pekin has a serious infection festering on the upper portion of his juvenile leg. Yes, these poor babies are just that, less than two month old babies, not even full adults yet. Absolutely disgusting and heartless people in this world. 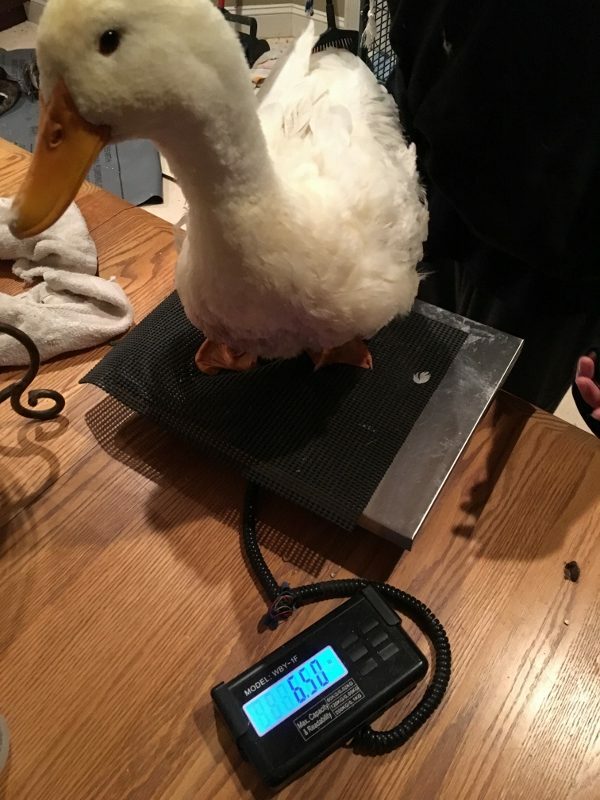 And as usually, all ducks appear to be very underweight for their age. Our vet was closed today, so we hope to get him in asap, either tomorrow or Friday. 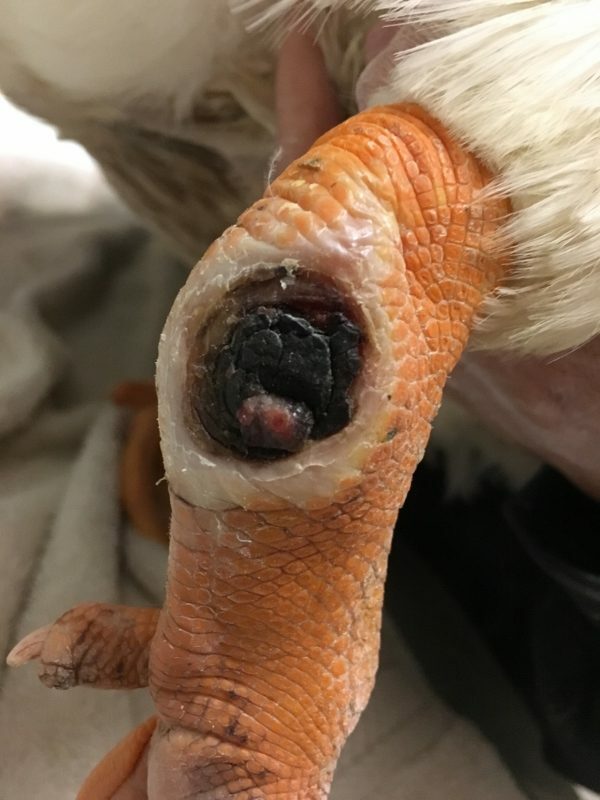 However, these types of infections do not usually hold out much hope if the infection had been lingering long enough to pass through the blood system. Sepsis is a nasty infection, especially in babies. He is on Oxytetracycline anti-biotic water solution in the meantime. He is a very gentle boy with a very difficult ability to walk at this point. Prayers always welcome!! Thank you!! If you have the ability or desire to assist in his upcoming medical cost, please do not hesitate to help. We deeply appreciate, and sincerely need help in these types of cases. Anything at all, truly does make a difference! ← Predators don’t always win!